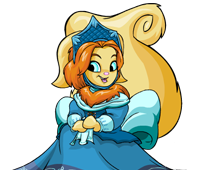 A new Mystery Picture game will be launched every Thursday in Neopets! We will upload a picture that appears somewhere on the site. It is up to you to guess what the picture is! To enter, simply type in what you think the picture is. For instance if you think its the tail of a red Scorchio, then type in 'red scorchio tail'. You dont have to be exact with your description, as our computer program will try its best to match your words with the correct answer. You have to be logged in to a Neopets Account in order to play!